I’m sure there are lots of people out there who say you should just embrace your dark circles. Not me. Ever since I started wearing make up it’s been all about covering up those pesky panda eyes. I’ve tried all the creams and the caffeine roller balls and I’m pretty certain mine are hereditary. I’ve found eye creams that have made them appear less dark, but nothing that makes me feel confident going make up free at all. Alongside the battle to fix them, comes the battle to hide them. I’ve gone through so many concealers over the years and at one point was using three at once. I’ve tried colour correcting concealers, heavy concealers and Touche Eclat dupes. Between terrible colour matches and folds that made me look about 60 I didn’t have much luck. Recently, I had at least found a concealer that was a good match – this Kat Von D number. It still wasn’t quite enough coverage though. I was also having to make do with it folding throughout the day. Luckily, I happened to discover two new products at around the same time which, paired with my Kat Von D, became an unstoppable force for my under eye circles. I haven’t had the greatest of experience with NYX before. I’ve been pretty underwhelmed by the products I’ve tried before. However after hearing people rave about this corrector, I decided to give it a whirl. It was pretty reasonably priced, so I knew it wouldn’t be a massive loss if I didn’t like it. This cream is extremely thick. I reminds me of the Bare Minerals concealer in consistency. I hate the design of the pot. The walls are so thick that I frequently get lots of the product underneath my nails when they’re long. The pot itself does at least feel weighty and well made which hasn’t been my experience of NYX products before. This gets patted on underneath my eyes with my fingers after I’ve applied my foundation. It’s a little darker than I’d like but it tends to blend well. The peachy tones here definitely help to calm down the darkness. Some days I can just about get away with wearing this on it’s own. On full make up days though, I need the extra steps. This concealer I’ve been using for a while (full review here) and in this technique I find a couple of blobs is enough to cover up my circles nicely. The thing that makes the difference here is the brush. I use an Ecotools Eye Defining Brush. This helps me tap the colour in without streaking. Moreso than any other concealer brush I’ve used before. At just £6.99 it’s reasonably priced and the quality is fantastic. I’ve had it over a year now and there’s no signs of it needing replacing soon. Superdrug finally stocks ELF! The first thing I picked up was this undereye setting powder. Folding has always been my biggest issue when covering up the dark circles so I had to give this a try. At just £4.50 it’s a massive steal. The first thing I will say is bin the brush. It’s terrible and way too small. Instead I’m using an angled blending brush from Look Good, Feel Better. It can be slightly off putting the first time you open the pot as it is pure white. At this point I should say that the pot is annoying and feels cheaply made. More often than not it’s a bit of a faff to get open. It’s only a minor issue, but it’s definitely worth saying. You don’t need a lot of this though. A slight dab with the brush and just sweep it under your eyes. Even if you do go a bit OTT, it sinks in invisibly so there’s no need to worry about ending up with strange looking under eyes. Once I sweep the powder over I do get a couple early folds but all I need to do is sweep the brush under my eyes a couple more times and then I’m good to go for the day. It holds everything in place and due to the colour, brightens up the area nicely. I’ve been using this for a couple of months now and I’m really happy with it. The combo of the NYX cover up and a good colour matched concealer means the darkness doesn’t come through at all. Finishing off with the ELF powder means that by the end of the day I no longer look like an old lady thanks to many folds. 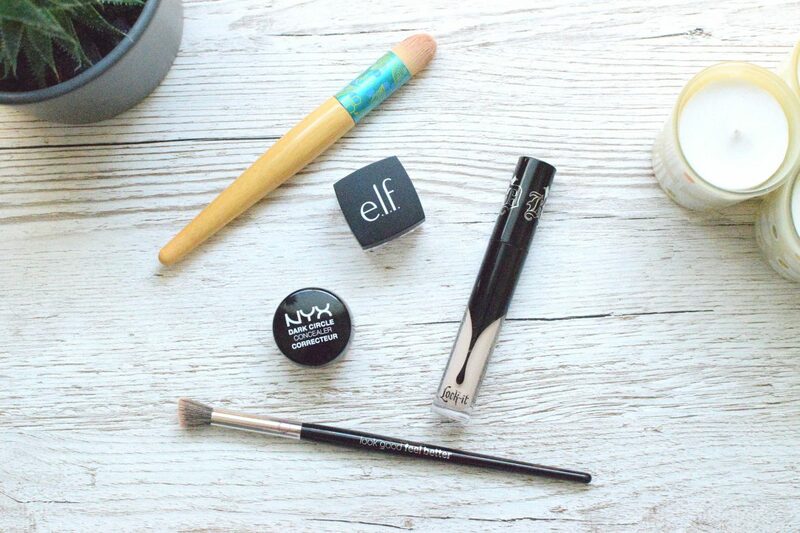 I’d say the NYX and the ELF are the must have products in this routine. The concealer is very easy to swap out and if Boots hadn’t discontinued their Stay Time Concealer, I’d be recommending that as a more affordable alternative. Any liquid concealer that matches your skin tone nicely will work here. Have you got any under eye coverage tips? Let me know in the comments below! This post contains affiliate links. They don’t cost you anything to follow, but do help keep this blog running!